The Fleshy Sea Pen is one of the most delicate and interesting corals found in the ocean's cooler waters! The Fleshy Sea Pen Ptilosarcus gurneyi is a soft coral, rather than a stony coral. But it is a unique soft coral, differing from other Octocorals in its habitat. While soft corals primarily attach to hard substrates, Sea Pens anchor themselves with their bulb-like shape into deep soft bottoms like sand or mud. They can also easily free themselves and move around. The Fleshy Sea Pen P. gurneyi has a large polyp with a peduncle, or base, that is buried in the sediment and an upper visible part that is a muscular fleshy stalk, called the rachis. The rachis is stiffer and supporting, and it can extended about 19" (50 cm) out of the substrate. Growing outward along the edges of this long middle "stem" are feeding polyps, each having 8 tentacles with small pinnate branches, giving it a feathery or quill pen look when extended. These feeding polyps have toxins with which they use to stun plankton. During the daylight hours Sea Pens usually bury themselves into the sand, and emerge at night to capture plankton, yet they will sometimes inflate and deflate several times a day as well. Sea Pens range in color from dark orange to yellow and white and are often bright. The Fleshy Sea Pen has a yellowish white peduncle with orange or yellow polyps. When touched or disturbed the Fleshy Sea Pen produces a bright green light known as bioluminescence, possibly used to ward off predators. The Fleshy Sea Pen can be difficult to care for. It needs dim light, low water movement, and regular nightly feeding of zooplankton or small particles of other meaty foods. It also needs 8" to 10" of substrate in captivity. This can be accomplished by putting a large piece of PVC within the rock work in which the Sea Pen can bury itself. Their propensity to pull out of their substrate to "find" a new place to settle gets them into trouble and leads to their poor history of survival in captive environments. Keeping a tank of at least 100 gallons and feeding nightly may help it to survive, and really only expert aquarists should attempt this deep water creature. Soft Coral Information: The Ptilosarcus genus and the Fleshy Sea Pen Ptilosarcus gurneyi were described by Gray in 1860. There are 5 species in this genus and they are P. gurneyi, P. quadrangularis, P. sinuosus, P. undulatus, and P. vierrillii. Some other common names the Fleshy Sea Pen P. gurneyi are known for are Orange Sea Pen, Sea Feather, Gurney's Sea Pen, and Stout Sea Pen. The Fleshy Sea Pen has not been propagated in captivity. 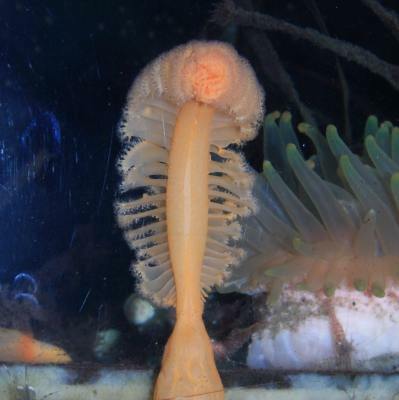 Where Ptilosarcus Corals Are Found: The Fleshy Sea Pen Ptilosarcus gurneyi are found in cold waters from the Alaskan to southern Californian coasts. The numbers of P. gurneyi, along with their predators, have declined in areas of the Puget Sound leaving large open areas of empty, sandy expanses that were once colonized with them. They have scientist wondering why this has suddenly happened, with it being possible that this means that their ecosystem in that area is in trouble. Ptilosarcus Coral Habitat: The Ptilosarcus genus are found on muddy or sandy bottoms from 25 to 300 feet (7 - 91 m) in depth. The Fleshy Sea Pen Ptilosarcus gurneyi is found in shallow subtidal zones to depths of 230 feet (70 m). They feed on plankton with the use of the nematocysts in their polyps. In the wild, they emit a bioluminescence, or bright green light when stimulated. Their predators include several different nudibranchs including the California Armina Armina californica which is very large reaching 3" (7 cm), Hermissenda crassicornis, Diamondback Tritonia Tritonia festiva; along with sea stars including the Red Star or Rose Star Crossaster papposus, the Leather Star Dermasterras imbriacata, Sunflower Starfish Pycnopodia helianthoides, Vermillion star Mediaster aequalis, and the Common Sun Star Crossaster papposus. The Fleshy Sea Pen Ptilosarcus gurneyi is not on the IUCN Red List for Endangered Species. What do Ptilosarcus Corals look like: The Ptilosarcus genus has a muscular peduncle that is fleshy and buries itself deeply in soft substrate like mud or sand. The upper part that is visible looks like an antique quill pen with the middle thicker part, called the rachis, being stiffer and supporting. From this long middle "stem" or large polyp, is a group of feathery feeding polyps with 8 tentacles that are growing outward from the rachis edges. They have toxins with which they use to stun plankton. There are also siphonozooid polyps pumping water and in and out of the Sea pen as needed to deflate or inflate. The leaf-like, feathery extensions that run off of the edges rachis are thin and fleshy and have small yellow, white, purple or orange polyps that can grow up to 1.5 feet (1/2 m). Sea Pens can contract or expand to huge levels and can fully retract into their base if there are predators around. They do have calcareous bodies that help to support the Sea Pen. The p. quadrangularis Sea Pens can reach up to 6 feet (2 m) in height, but the other species are usually around 18" to 24" in height. They typically deflate fully and inflate to feed several times a day. The Fleshy Sea Pen Ptilosarcus gurneyi has a yellowish white peduncle with orange or yellow polyps. It can extended about 19" (50 cm) out of the substrate. The Fleshy Sea Pen reaches sexually maturity at about five years and are estimated to live about 15 years in nature. It is speculated that it is not age that leads to their demise, but rather predation and parasitic infestations. Soft Coral Care: The Fleshy Sea Pen P. gurneyi can be difficult to care for, and really only expert aquarists should attempt this deep, cool water creature. It needs low light, low water flow, and regular nightly feedings. It also needs 8" to 10" of substrate in captivity. This can be accomplished by putting a large piece of PVC within the rock work in which the Sea Pen can bury itself. Their propensity to pull out of their substrate to "find" a new place to settle gets them into trouble and leads to their poor history of survival in captive environments. Keeping a tank of at least 100 gallons and feeding nightly may help it to survive. Soft Coral Feeding: In the wild, Ptilosarcus corals capture planktonic organisms and microscopic food particles from the water column. In captivity, the Fleshy Sea Pens are filter feeders and will eat particles of detritus that you stir up from the substrate and can be fed zooplankton and other high-proteins small particle foods such as Artemia nauplii, Daphnia, and pulverized flake food. They need to be fed nightly. Stable tank conditions are needed to keep the Ptilosarcus genus. Doing water changes of 20% a month or 10% biweekly is needed, although it is suggested that doing 5% water changes once a week will replenish many of the needed additives. Calcium and other trace elements can be added to maintain proper levels for good growth. The Fleshy Sea Pen P. gurneyi is a cool water species, so a chiller may be required. An established live rock/reef environment is what is needed for your Fleshy Sea Pen, along with some fish for organic matter production. The substrate must be at least 8" (20 cm) and have enough water to keep them feeding, but not enough to dislodge them. The tank should be at least over 2 feet in depth. You can put a deep flower pot in the tank filled with sand, or add a large, longer piece of PVC and fill that with sand, putting it within the rock work instead of making all the sand in your tank that deep. If the Sea Pen decides to float, they will not be able to reattach to a shallow sand bed so must be guided back to the PVC if the sand itself is not very deep. Provide proper lighting and water movement. They need dim lighting and a low water flow. This is a peaceful species and will not bother any other corals in the tank. The Fleshy Sea Pen is peaceful and is usually fine within proximity to other corals that are peaceful. When P. gurneyi is fully mature, it will provide shelter for juvenile fish and some other small creatures. Each colony is either male or female, though females are usually predominant in nature. Distinctions between them are not easily detected by aquarists. The Fleshy Sea Pen P. gurneyi will reproduce by releasing sperm and eggs in to the water. The eggs develop into planulae larvae and drift for a week before settling into their new home on a preferred substrate. Propagation is not documented or known at this time. The Ptilosarcus genus is a hardy coral but proper tank conditions and adequate feeding are more difficult to provide. In nature they are heavily predated upon. Between predation and parasites, they are estimated to live only about 15 years in the wild. Their predators include several different nudibranchs including the California Armina Armina californica which is very large reaching 3" (7 cm), Hermissenda crassicornis, Diamondback Tritonia Tritonia festiva. As they mature they become prey for sea stars including the Red Star or Rose Star Crossaster papposus, the Leather Star Dermasterras imbriacata, Sunflower Starfish Pycnopodia helianthoides, Vermillion star Mediaster aequalis, and the Common Sun Star Crossaster papposus. They have been found subject to parasitic infestation in nature as well, seen as 'warts" on the leaves. These are the result of a parasitic isopod living inside a Sea Pen's tissue. Soft Corals for Sale: The Fleshy Sea Pen P. gurneyi is somewhat difficult to find at pet shops and on line. Special ordering from your local fish store may be necessary, and only if your husbandry is able to sustain this creature.